Some moments from a recent assignment in Hawaii for Bon Appétit Magazine and Hawaii Visitors & Convention Bureau. The Surfjack in Honolulu. 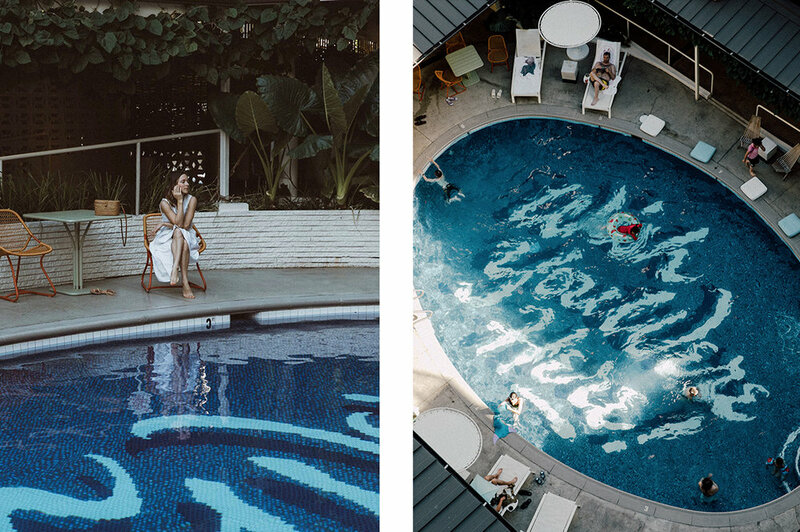 This small boutique hotel offers vintage surf inspired suites and bungalows around a very photogenic pool (and it's right next door to the best coffee in town). The Poke was amazing everywhere, but we loved low key ONO Seafoods in Honolulu. My favorite was #3 Hawaiian Style Ahi, with sea salt, green & white onion, lime, kukui, chili and sesame oil. Ocean Bree’z food truck on the North Shore Oahu, owner Marcus is super passionate about his food. I’ll be dreaming of his garlic shrimp and lobster for a long time to come. The Elephant Truck on the North Shore Oahu is incredible. Get the roasted peanuts w/ lime leaf, vegetable spring rolls and Goong Nam Prik Pao and head down to the beach over the road for a sunset picnic. Bonus: everything they serve is grown and produced within a ten mile radius of the North Shore. Honolulu BeerWorks—We loved this spot in Honolulu and the local brews are delicious. Try the Sunrise Swell Pale Ale and don’t miss a game or two of corn hole in the garden. Hawaiian Shochu Company—owners Ken and Yumiko Hirata are quietly at work creating Hawaii’s most delicious Shochu using ancient Japanese techniques of distilling the spirit from sweet potatoes grown nearby. Each year Ken commissions a different Hawaiian artist to produce artwork for the bottle, resulting in beautiful, collectible one-offs. This is local, sustainably sourced production at it’s best and highly worth a visit. Explore leafy Kahumana Organic Farm in the foothills of the lush green mountains.The farm is rooted in community, providing support to homeless families, people with disabilities and youth.